There is a very interesting concept taught in "B Schools", by one Mr. Maslow, from his 1943 paper on "The Theory of Human Motivation". (There is a theory about it? 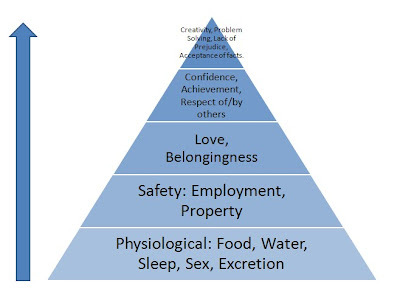 :O That explains a lot of things :P ) This states that there is a "hierarchy" of "needs" that people have, and one moves up (or, is motivated to move up) in the hierarchy once the lower order needs are met. 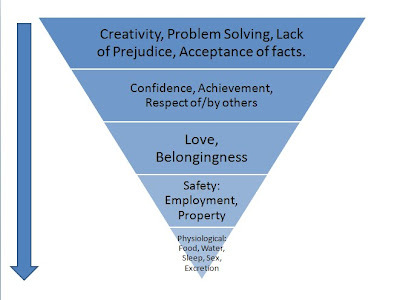 This can be depicted in a pyramidal figure as shown below for a better understanding of the concept. The figure is not really difficult to understand. First you fulfill the basic needs (as given in the bottom layer), and then gradually progress upwards. Let me not explain it, I ll come straight to the point. A little explanation would not hurt. 2. We gain confidence, we achieve, we see "GODs", we respect them. i'm writing on this for a public organization theory class. it's fun.